There are marked differences in life history traits between humans and our closest living relatives chimpanzees. Compared to humans, chimpanzees reach maturity at earlier ages and the onset of ageing in chimpanzees also occurs at earlier ages. 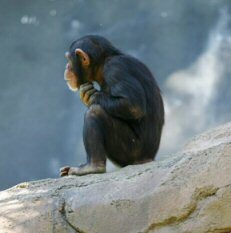 Even chimpanzees kept in captivity develop age-related changes typical of humans at earlier ages. More detailed studies of ageing in chimpanzees are necessary to establish whether the pace of ageing in chimpanzees happens at a faster pace than in humans, but it is clear that the onset of ageing occurs earlier in chimpanzees, even in captivity. Therefore, genetic changes must be largely responsible for the differences in life history between these two closely-related species. The goal of this work is to gather clues about the genetic changes responsible for such differences in life history schedules, which may have implications for our understanding of human ageing, by comparing the human and chimpanzee genomes. Caption: photograph by Aaron Logan. de Magalhaes, JP and Church, GM (2007) "Analyses of human-chimpanzee orthologous gene pairs to explore evolutionary hypotheses of aging." Mechanisms of Ageing and Development 128:355-364. Succinctly, we show that aging-associated genes (e.g., genes derived from the GenAge database) tend to evolve slower and be more highly conserved than expected by chance. Our results also suggest that different evolutionary forces act on genes associated with aging in different model systems. The supplementary material is available below and we are also working to integrate these results and analyses into GenAge. chimpanzee_supplement.zip, zipped file with the raw dataset featuring GenAge and longevity-associated genes.